A local brewmaster brings handcrafted kombucha to the thirsty masses. 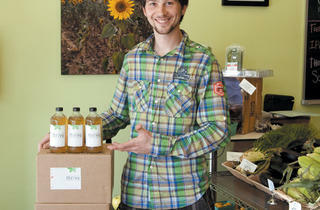 CULTURE STARTER Wyse delivers his Thrive Kombucha to Green Grocer. Shortly after moving from Kankakee to Chicago in 2006, Nathan Wyse, 28, started noticing his less-than-exemplary diet. “I realized that I ate really unhealthy,” he remembers. “Like steak, cheese and sour-cream burritos for lunch.” That led Wyse to explore the city’s health-food scene in search of a better, more nutritious lifestyle, and soon he was converting from a carnivore to a vegetarian and swapping out conventional produce for organic. His most important health discovery, though, happened in Whole Foods, where he stumbled upon kombucha, a fermented drink made by mixing a colony of yeast and bacteria with tea. Kombucha has purported health benefits, including aiding digestion, detoxification and a general increase in the body’s vitality. “It said all the right things to me,” Wyse says. Pretty soon, he was hooked. Recognizing an opening in the marketplace—despite the growing demand, there were only a few major players (namely GT’s Kombucha) producing the drink—Wyse decided to make a business of his brew. “With the food system we have in effect these days, everyone could really use a truly healthy beverage,” he says. 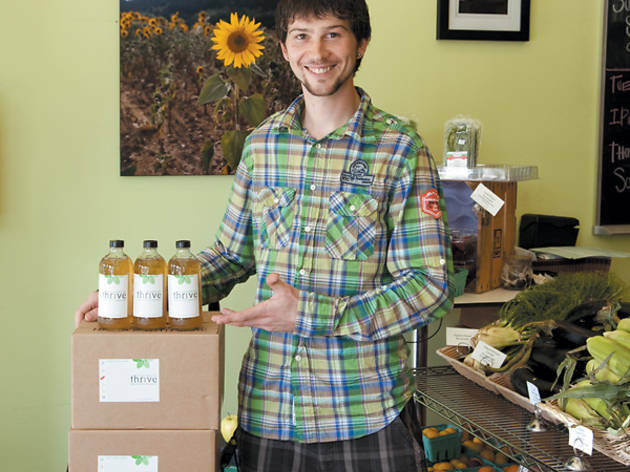 In the summer of 2008, he sold his kombucha on what was essentially the kombucha black market, offering it to customers while working at a Green City Market booth. “I could talk about kombucha in almost any conversation,” he says. Apparently he can also sell it in any conversation, because the following summer his business was brisk enough for Wyse to set up legitimate shop with his Living Well booth at a farmers’ market in Hyde Park. By spring 2009, he stepped up production and moved into North Side raw-food restaurant Cousin’s Incredible Vitality, where he concentrated on perfecting the consistency of his commercial production in the basement kitchen. For the most part, he sold to customers participating in the restaurant’s detox program or people picking up food to go. “I never realized the value of having these cultures,” he says. “Now I have [ones] that are two feet in diameter, but it takes two to three months to grow.” (Speckled with brown yeast cells and flat like a pancake, the yeasty bacterial colony resembles a mushroom with the tough texture of well-done steak. It continues to grow to fit the size of its container.) In a little more than a year, Wyse went from churning out 25 to 30 gallons per week to 100 gallons per week, divvying up the batches between the restaurant’s customers and events like Chicago’s Green Festival. Just a month ago, after a financial disagreement with the restaurant’s owner, Wyse moved out of the basement space and into a commercial building in Pilsen called Eco Cooperative. He also started selling his brew under the name Thrive at four new locations: West Town’s Green Grocer, Logan Square co-op Dill Pickle, New Wave Coffee and Life Spring Health Foods & Juice Bar. Timing is on Wyse’s side. At the same time that he was stepping up his production, major markets like Whole Foods pulled GT kombucha off the shelves due to high levels of alcohol content. (Normally kombucha is said to contain less than 0.5 percent alcohol.) Meanwhile, kombucha lovers are frantically looking for ways to get their fix, and boxes of coconut water don’t always cut it. Wyse isn’t too concerned that the FDA will come after him. “A healthy kombucha culture produces nonalcoholic kombucha, and I guarantee that mine is healthy,” he says. By now, Wyse has the capacity to brew 150 gallons at one time, but he’s working with three 30-gallon tanks at the moment. It’s a continuous brew, which means no tank is ever empty—every few days he takes ten percent of a tank out to bottle and adds ten percent back in. Meanwhile, he’s taste testing, checking the pH balance and temperature (it needs to be around 79 degrees for the yeast and bacteria to work together properly), bottling a batch of four to five cases and labeling. He switches out the culture every few months to ensure it remains healthy. For the most part, though, “kombucha likes to be left alone, which is hard when you keep interrupting it,” Wyse says. He’s still working out kinks in the process, like which bottle caps will keep the drink fizzy and prevent it from continuing to ferment. As for the flavors, the list keeps growing. For now, he offers three options: the original, which is a blend of wild harvested and certified organic yerba maté; red bush tea mixed with the yerba maté blend; and holy basil tea mixed with the yerba maté blend. Three more flavors—yerba maté infused with ginger, cranberry peppermint and pomegranate acai—are in the works. Because he’s not making a profit yet, he spends five days a week at a new green restaurant, Prasino, in La Grange, where he mans the juice bar full-time, whipping up raw juices and conscious cocktails, some of which are infused with his own kombucha. In the long run, he’d like to open a café or nutrition studio in a college town where he can sell kombucha to the impressionable masses. But for now, he’ll focus on increasing his production to sell to local businesses. To order a case of Thrive kombucha directly from Wyse, e-mail him at livingwell.bev@gmail.com.